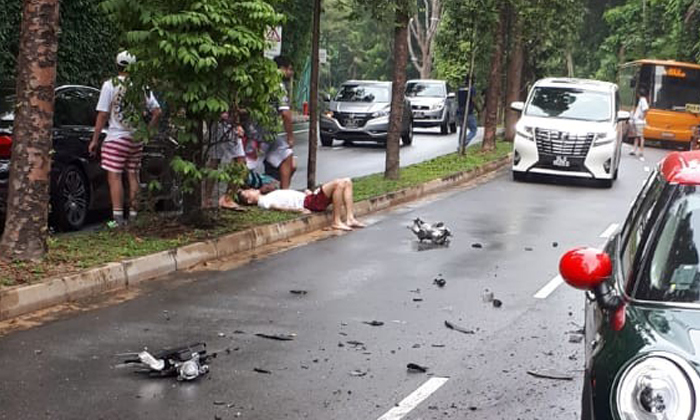 Three people were injured in an accident involving a Lamborghini, a Mini Cooper, and a Toyota Estima at Sentosa on Tuesday afternoon (May 29). The police were alerted to the three-car accident along Allanbrooke Road towards Cove Avenue at 4.53pm, they told Stomp in response to queries. The 22-year-old Lamborghini driver, his 21-year-old male passenger, and the 38-year-old male Toyota driver were conscious when taken to Singapore General Hospital. Several Stompers alerted Stomp to photos of the accident that have been circulating online. The yellow Lamborghini can be seen overturned with a mangled front bumper, while the Toyota's right side was wrecked. The Mini Cooper had a damaged left headlight, and in front of it lay a fallen tree trunk. Videos also show an ambulance and paramedics at the scene.